How did Blofeld's control center manage to have live video feed of their own spaceship? In You Only Live Twice, Blofeld's launch control room had a monitor that displayed a video feed of their own spaceship, from the side. How did they manage to do that, in-universe? No obvious solution comes to mind. It was up-close feed, so it couldn't have been taken with a camera on Earth, and the angle and distance shows that it couldn't have been taken from the spaceship itself. And they didn't exactly have a chase spaceplane shadowing their spaceship. A satellite or other auxiliary spacecraft. Also, typical movie cliché regarding impossible security camera angles. 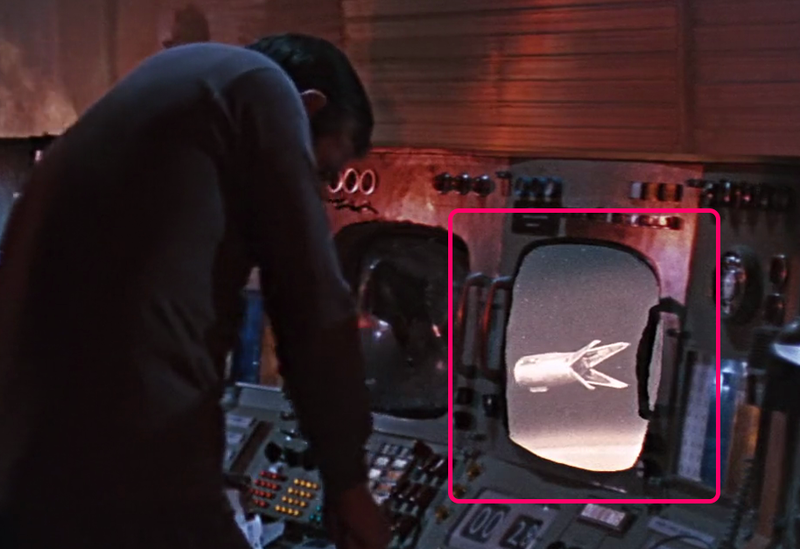 In the 1967 film, no explanation is offered by any of the SPECTRE agents as to how they are able to monitor their spacecraft closing in on the American vehicle in orbit, even though as the o/p correctly points out there is a live video feed displayed on a tv monitor screen in the SPECTRE control room showing it from a distant point-of-view that is clearly also in orbit. I had always assumed that this is a vision feed from a SPECTRE communications satellite in a similar orbit. But I cannot find any other evidence in the film, apart from the obvious monitor pictures themselves. In the plot, Blofeld is monitoring the capture of the American capsule because he intends to blow up his own vehicle immediately after the capture, in order to visibly destroy the American mission so as to cause a third world war. Hence he needs to be able to see when the capture occurs, to be sure of achieving this goal. Thus there is a legitimate reason why SPECTRE would have that monitoring capability, and so the plot is implying it is a SPECTRE satellite doing the monitoring. Bond simply doesn't waste any time on the point, having too many more pressing problems. For those who don't recall the 1960s, there were in that decade many communications satellites in orbit: it was not a wild, science fiction idea. The space missions shown in the film were all potentially possible, as they all occurred in Earth orbit. The only element of fiction was the idea that anyone other than a major government could afford a manned spaceshot! Not the answer you're looking for? Browse other questions tagged plot-explanation james-bond you-only-live-twice . Why did Zod ask for Lois Lane to come on their spaceship? How did the Enterprise return to their own timeline at the end of First Contact? How can gods be affected by their own power? Why take that “glass floor” risk in the museum?